Still, the fact Michigan played much of the game with a lead in the 6-10 point area shows how calm and collected Michigan was, especially defensively, all night. Below is the defensive score sheet for the Michigan's 77-70 victory - its first at the Kohl Center against Bo Ryan. I wrote the following after Michigan's 72-70 loss to Arizona: "This team will really, really miss Mitch McGary as the season progresses." While I still think Michigan will miss his presence I'm seeing more and more growth from Jon Horford and improved play from senior Jordan Morgan to think the Wolverines will be just fine. 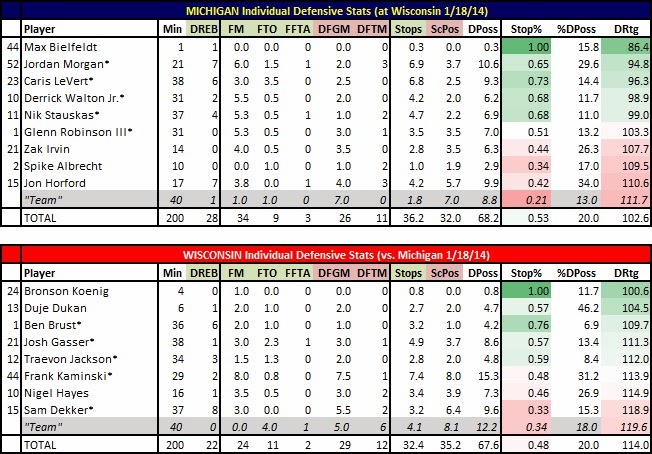 Horford's overall numbers were rough against Wisconsin but Morgan had a terrific game, both in man-to-man situations and on help-side defense in which he blocked a few shots and forced part of two turnovers. As long as this duo can stay out of foul trouble the center combination won't be Michigan's downfall. After Michigan's 79-69 loss at Duke I wrote: "In games where Michigan excels I guarantee Caris LeVert will be a reason on the defensive side of the ball. When Michigan struggles chances are LeVert is having an off game." No surprise that LeVert's side bothered Wisconsin's smaller guards and his active hands helped force 3.5 of Wisconsin's nine turnovers. It will be interesting to see if LeVert keeps his switch "on" whenever he's on the court or if there are times when, like Michigan State's Branden Dawson, he seems to be snoozing or on auto pilot. Caris LeVert with another defensive play (AP). Anyone who says, "Trey Burke who?" is an absolute joke but Michigan fans have to be impressed with the quick growth Derrick Walton Jr. has shown in the recent month. The game has slowed down to him and I think we're seeing it more on the defensive end now. The confidence he's building on offense - even though Nik Stauskas runs the show much more than expected - is clear and he's playing his role as well as anyone on the team. Sam Dekker had a rough game. I haven't seen enough Wisconsin games throughout the year to know if this was an aberration or if his defense is really lacking. He struggled closing out on shooters, namely Stauskas, on Saturday and he wasn't much better preventing drives to the basket. I really like Dekker as a player and he's only going to get better offensively but I'm curious how Wisconsin fans will feel if he continues to look like a defensive liability. This is what Sam Dekker looked like on defense much of the game (AP).